To play this event, you must command three personnel at your space mission. Lose 5 points to reveal the top two cards of an opponent's dilemma pile. Place face up beneath that mission any dilemmas that could be faced there. Replace the remaining cards in any order. Destroy this event. 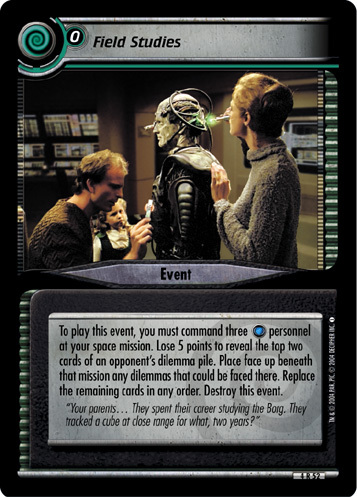 "Your parents...They spent their career studying the Borg. They tracked a cube at close range for what, two years?" Characteristics: manipulate / examine opponent's dilemma pile, place opponent's dilemmas under your mission, lose points. There are 15 entries for Field Studies (ST2E 4 R 52) at the Tradeplace (8 haves and 12 wants). Click here to see all trade list entries for this Rare card!